This free Bible lesson is part 2 of 10 in our Lord’s Prayer study. The focus is on Jesus’ introduction to this model prayer in the preceding verses. His directions help us better understand what attitudes matter most to God when we pray. Click here to browse all the lessons in this 10 part teaching unit. 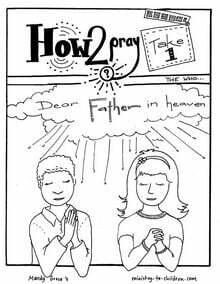 Your children may also enjoy our coloring book based on the Lord’s prayer. Main idea: The Bible shows us not only how not to pray, but some helpful things to remember when praying. Make scripture cards by writing the bold scripture references below on white paper (half a sheet of computer paper or large index cards work well) with white crayon. Make some fake cards by drawing pictures or writing silly phrases on them. Mix these in with the scripture cards. Take time to consider your prayer life. Do you make a habit of talking to the Father every day in every situation, or only “when you have time” or in emergencies? Don’t feel guilty if your prayer life isn’t what you want it to be. Instead, repent and revel in God’s grace. Come into his presence now with a child-like wonder, and enjoy talking to your heavenly Father about the big things, the little things, and the in-between things. 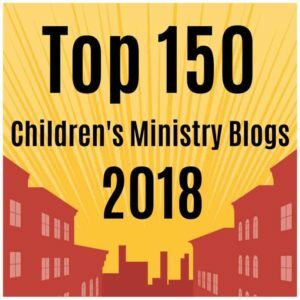 Consider starting a prayer journal of your own, if you have not already done so. Game: Bible verse scavenger hunt. Before class, set up the game by placing the scripture cards and fake cards all around the room. Hide them as conspicuously or inconspicuously as your class can handle. Remember, these look like blank pieces of paper, so you may want to place them in obvious locations or attach them to brightly colored paper. You could also put them all in bright envelopes and have the kids look for the envelopes. When your class comes in, explain that they will be hunting down secret messages. Describe that the messages are hidden on plain white paper (or index cards, or in envelopes, however you choose to do it.) They won’t be able to see the message right away, so they will have to use a special decoder to discover if the message they find is a special message from God from the Bible, or if it is a silly message from you. Pass out a washable marker to each child and have them go on the hunt. When they find a message, they will color over it with their marker. The marker will color the paper, but not the white crayon. Encourage them to help each other, so each student can decode at least one message. Once all the messages are found and decoded, they return them to you. Special messages from God go in one pile and silly messages from you go into another. The markers go back where they belong and the class takes their seats. Tell them that you will go over the messages as a group later on in the lesson. Say, Last week we started a new lesson together. Who can remind the class what we are learning about? That’s right, we are learning about prayer. Starting next week, we will study the Lord’s prayer. The Lord’s prayer is an example prayer Jesus taught to his disciples. Before we look at that prayer, first we must learn a few things about prayer. Last we week learned that prayer is talking to God the Father, through Jesus Christ the Son, by the power of the Holy Spirit. This week we are going to learn some dos and don’ts to prayer. Pretty much everything in life has ways to do things that work really well, and ways that don’t. Think of riding a bicycle. It works well when you wear your protective gear, pedal, hold onto the handle bars and look where you are going. It does not work when you close your eyes, sit on it backwards and wave your arms in the air. Just like riding a bike has do’s and don’ts, prayer has do’s and don’ts. We find these in the Bible. First we will look at some don’ts. This is what Jesus said right before teaching his disciples the Lord’s Prayer. What are the two ways Jesus tells us DON’T pray in this passage? (Allow time for students to answer. Remind them to refer to their Bibles.) The first don’t is don’t be like the hypocrites. A hypocrite is a person who says they believe one thing, but then they do another. Here it’s talking specifically about prayer. Prayer is talking to God. When you have a conversation with a friend, do you like to stand on a street corner or in the middle of the hallway at school so everyone can see and hear you? Of course not! People who want to have their conversations overheard are usually just trying to show off. The hypocrites in this passage are showing off how good they pray, and God doesn’t want us to do that. He wants our prayers to be special conversations with him. The second don’t is don’t babble. Babble is a word we usually use when we are talking about babies. When babies are just learning to talk, the make a bunch of funny noises and repeat the same sounds over and over again because they like how it sounds. Babbling is a good thing to do when you are a baby, but not when you are talking to God. God doesn’t need us to repeat ourselves. He knows what we’re going to say before we say it! Think about when you go to your Mom or Dad to ask for something. If we say, “Dad, can I cookie?” Dad will say “yes,” “no,” or “later.” If we say, “Dad can I have a cookie? Dad can I have a cookie? Dad can I have a cookie? Dad can I have a cookie? Dad can I have a cookie? Dad can I have a cookie?” The issue here is trust– we must trust that God knows what is best and be willing to wait for his timing. It’s not wrong to “pray without ceasing” but we must not think we can badger God into obeying us! Craft: Decorate prayer journals. Give each child a small composition notebook. Explain that it sometimes helps to write some of your prayers, so you can look back over time and see how God has answered your prayers. Prayers in your journal can take any form. You can make lists, write prayers like letters to a pen pal, compose songs or poetry, or even draw pictures. This is a little book to express your thoughts and feelings to our heavenly Father. To decorate them, glue on paper to the cover, color it, and add stickers. There really is no limit to how you can decorate your journal. When finished, wrap the covers in clear packaging tape to make them sturdier and protect the artwork. Take your journal home and write in it every day! Tony Kummer (Editor) reviewed & updated this page on : January 31, 2014 at 8:19 am. All our content is peer reviewed by our readers, simply leave a comment on any post suggest an update.